A wildfire blackened several hundred open acres near San Diego Zoo Safari Park Friday, forcing residential evacuations and shutting down part of a rural highway as ground and airborne crews scrambled to corral the fast-moving flames. 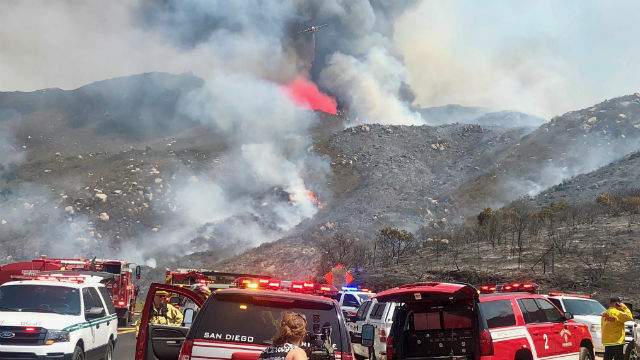 The blaze erupted for unknown reasons off the 17000 block of state Route 78 in the San Pasqual Valley shortly before 1:30 p.m., according to the San Diego Fire-Rescue Department. Within 90 minutes, the blaze had burned across more than 200 acres. By 7:30 p.m. the fire’s progress had been halted with 240 acres burned. Most of the active flames were doused and containment was at 5 percent, Cal Fire reported. As the flames spread rapidly to the southeast, authorities shut down state Route 78 between Bandy Canyon and Ramona Highlands roads as a safety precaution and to expedite the firefighting operations in the rural area. State Route 78 remained closed between Bandy Canyon and Haverford roads as of 7:30 p.m., according to Cal Fire. Sheriff’s deputies cleared people out of homes potentially in the path of the fire. Vacated areas included neighborhoods along Via Cuesta; Via Vista Grande; Prestige Street; Day Star Way; Oak Grove, Rancho Villa, Rangeland, Rustic Villa and Weekend Villa roads; and Cinque Terre, Corniglia, Highland Hills, Horizon View and Rio Maggiore drives. The displaced residents were encouraged to wait out the fire at Ramona High School. Administrators at San Pasqual Academy, a secondary school for foster teens near the origin point of the fire, decided on their own to evacuate the campus, police said. The blaze had caused no reported structural damage or injuries as of early evening. Crews will remain in the area into the weekend, getting lines of containment around all the charred terrain and making sure all hot spots are snuffed out, Cal Fire Capt. Issac Sanchez said.